Many guys prefer the bucket seat/center console look and decide to change their bench seat cars over to this style. In their search for bucket seats I am often asked what year/type seats are interchangeable, so I decided to write this article to help answer some of these questions. All 64-72 GM A-bodies, as well as some others, used Strato Bucket Seats, but there were many changes with frames and cushions during that time. Below is a list of the major frame/seat trim panel differences. and use no trim panels. and use metal trim panels. system with a release button on the side, they also use metal trim panels. button, but the trim panels are now plastic. center mounted seat back release button, and the trim panels are plastic. They also come standard with headrests. covers down along their entire length, giving them a 3-dimensional look. the differences in seat cushions. 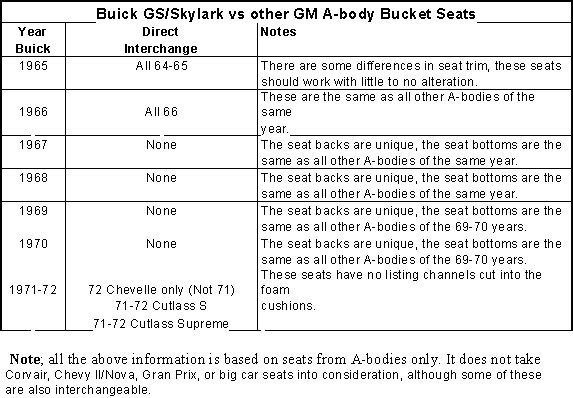 Below is a list of seats that will interchange with Buick GS/Skylark seats. I hope this helps.